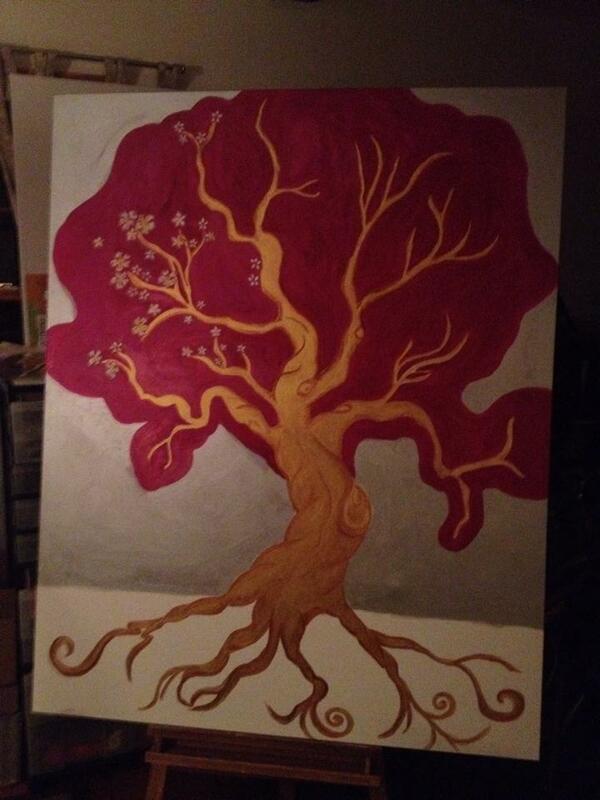 Spring Forth was one of the few paintings I had time to finish this Spring 2014. After working on my website and then a busy work schedule plus planning for 22 days abroad, I finally finished this one right before we left for Europe. Spring is my favorite time of year. Full of life and rebirth, creativity and hope. Fall, on the other hand, depresses me greatly and I find I want to burrow into my shell. 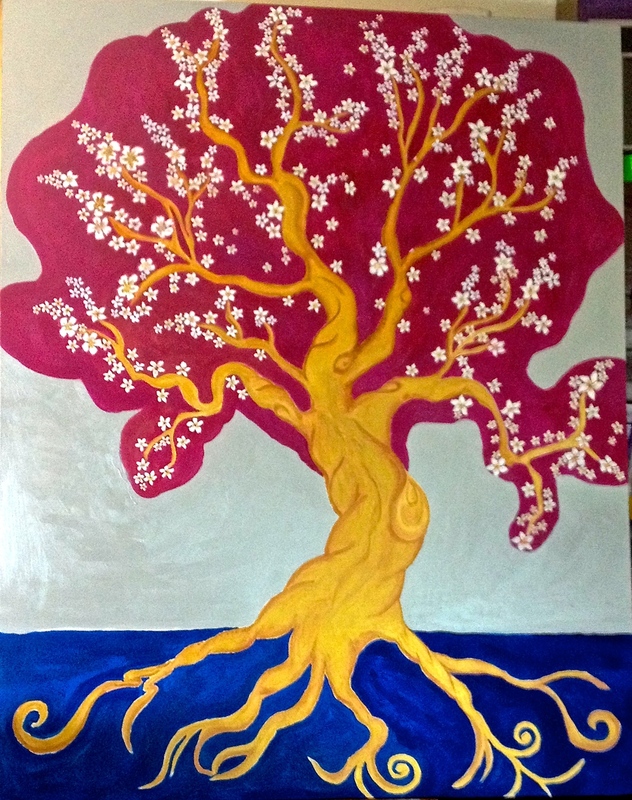 Spring 2014, I knew I wanted to do a cherry blossom tree as it has so many meanings - different in every country - but it is definitely revered for its beauty and symbolism. I believe in the DUAL symbolism of both Japan and China. Different but both very representative of my thoughts and feelings. In Japan, the cherry blossom represents the fragility and beauty of life. It is a reminder that life is almost overwhelmingly beautiful but that it is also tragically short. 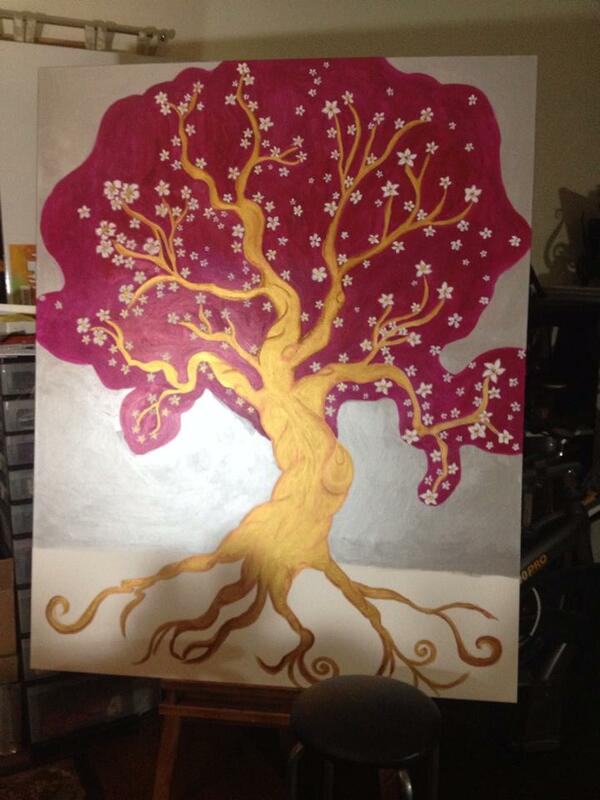 In China, the cherry blossom symbolizes feminine beauty, the feminine principle, or love in the language of herbs. They are also the symbol of feminine beauty and sexuality. It has also come to represent the feminine principle and love. As I look at my grief process - I recognize the Japanese symbolism of the tragically short life of my husband - and I see myself in the Chinese symbolism of feminine beauty and strength, of my journey to come in to my own. This spring, I wondered about my beauty, my strength, my femininity, and my sexuality - and if I could rebuild all of it alone without a life partner. And now, as Fall passes and we enter the stark winter, I take the time to be still and introspective fully knowing the joy and growth I will have in Spring. 'Cherry blossoms also symbolize clouds due to their nature of blooming en masse, besides being an enduring metaphor for the ephemeral nature of life, an aspect of Japanese cultural tradition that is often associated with Buddhistic influence, and which is embodied in the concept of mono no aware. " 'Mono no aware' : the "ahness", "sadness" of things/life/love; nothing is permanent, all is change - Shinto expression of beauty and awe ("aware") plus Buddhist feeling that life is suffering, changing, unstable and impermanent ("mujo")."